SAN MATEO, CA - January 18, 2018. BrightEdge, the global leader in organic search and content performance, announced today its continued transformation as an AI-First company. Driven by the industry's first and most powerful deep learning engine, DataMind, BrightEdge is making it easier for marketers to deliver a better customer experience and increased performance across all digital channels, content marketing, and organic search. 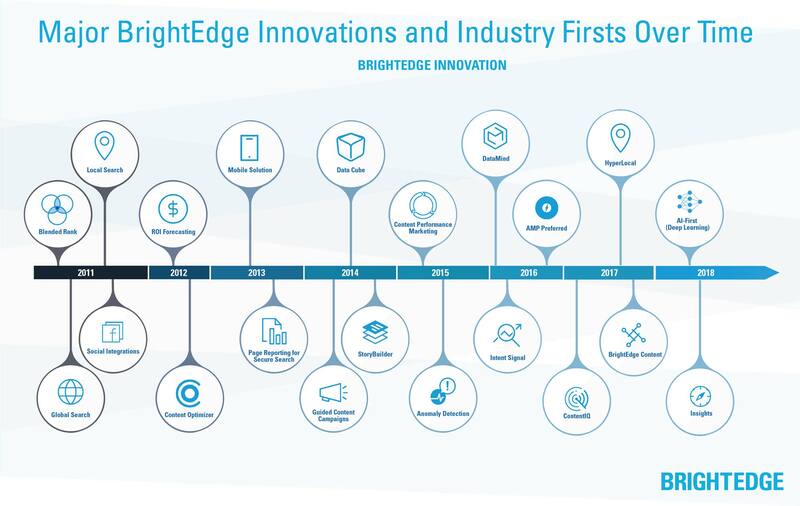 As BrightEdge marks its 10-year anniversary in 2018, the company is emerging as a leader in artificial intelligence with the launch of several cutting-edge innovations powered by DataMind. Recent BrightEdge research revealed that not only is the customer journey predominantly digital, but also that this digital journey is entering the post-mobile world. 57% of all searches are now conducted from mobile devices and over 20% of mobile searches are voice-activated. In this post-mobile world, it is increasingly difficult for brands to reach the connected consumer in an authentic way. To this point, BrightEdge research found that over 80% of content produced is never found by its audience. By 2020, customer experience will overtake price and product as the key differentiator between brands. The need to change and adapt to the connected consumer requires marketers to tackle one of their biggest challenges head on - the over-abundance of data and the value of insights that can be derived from this. For marketers, there is simply too much data out there to process, segment and analyze. Data is often unstructured and scattered across multiple data sets, making it hard to use. Despite having access to data, marketers often struggle to transform this data into actionable insights. To solve this challenge, successful brands recognize that AI, deep learning and automation is now mission-critical for staying ahead of market trends, consumer preferences, and competitive shifts in the market. DataMind, BrightEdge’s proprietary deep-learning engine, organizes and makes sense of all relevant data – at a size and scale not possible manually. Unlike simple machine learning, deep learning requires both powerful computing power and massive amounts of relevant data. Machine learning uses thousands of data points, whereas deep learning uses millions. Successful companies of the future will dominate their markets by bringing together digital marketing, search, and content marketing to deliver consistent digital experiences across all customer touch points, including web, mobile, email, and social to create a strong competitive advantage. “For the past several years, BrightEdge has been on a journey to become an Artificial-Intelligence (AI-First) company,” said Jim Yu, CEO and Co-founder of BrightEdge. “We believe that it is essential for every business to have AI-First capabilities. For BrightEdge, this journey started with the Data Cube nearly 10 years ago. Since then, we were first to market with a next-generation deep-learning technology, DataMind, using the same deep-learning best practices applied by Google in its voice and image recognition algorithms. DataMind has been woven into the BrightEdge Platform to power search, content, and digital marketing solutions that will power our customers on their own AI-First journey”. For nearly 10 years, BrightEdge data scientists have assembled the gold standard of data by pairing first-party data with unique proprietary data from the BrightEdge Data Cube, the industry’s largest content repository. BrightEdge’s team of data scientists began using massive data-sets to build and integrate DataMind into the BrightEdge platform with the purpose of unlocking accurate and valuable insights for customers. Data Cube: The industry’s largest content repository and the industry’s most complete data set for tracking performance across the web. Data Cube is used to prioritize and formulate successful search, content, and digital strategies. BrightEdge Data Cube consists of billions of pieces of digital data including content, rich media, search terms and social signals––all at internet scale––to provide companies with the insights they need to make decisions that drive revenue. BrightEdge DataMind: DataMind is a powerful deep-learning engine that instantly identifies important digital trends, competitive threats, and market shifts in real-time. BrightEdge Data Mind unlocks valuable and profitable insights to help marketer accelerate digital marketing performance. BrightEdge Content: Powered by BrightEdge DataMind, BrightEdge Content blends the best of search marketing and content marketing to make it easier for marketers to discover, create, and activate high-performing content across any digital channel. Visual Parsing: Analyzes the dynamic SERP through the eyes of a human. Instead of just inspecting the backend codes, visual parsing technology looks at the visual layout of each SERP in relationship with each keyword to help marketers determine what content type is more likely to win the top spots on a SERP. BrightEdge Insights: BrightEdge Insights is an AI-powered solution that acts like a marketer’s personal data analyst. Each week, BrightEdge Insights examines millions of web pages with thousands of changes. Based on this statistically significant analysis BrightEdge Insights identifies changes outside the normal behaviors of each web page. It then prioritizes the most-relevant findings so marketers can focus on the initiatives with the biggest impact on their business. To learn more about how AI is transforming the way that marketers approach digital marketing join Paul Roetzer from the AI Institute and BrightEdge on January 30th in this free to attend webinar. BrightEdge, the global leader in enterprise organic search and content performance, empowers marketers to transform online content into business results such as traffic, conversions and revenue. The BrightEdge S3 platform is powered by DataMind, a sophisticated deep learning engine and is the only company capable of web-wide, real-time measurement of content engagement across all digital channels, including search, social and mobile. Brightedge’s 1,500+ customers include global brands such as 3M, Microsoft and Nike. The company has eight offices worldwide and is headquartered in Foster City, California.